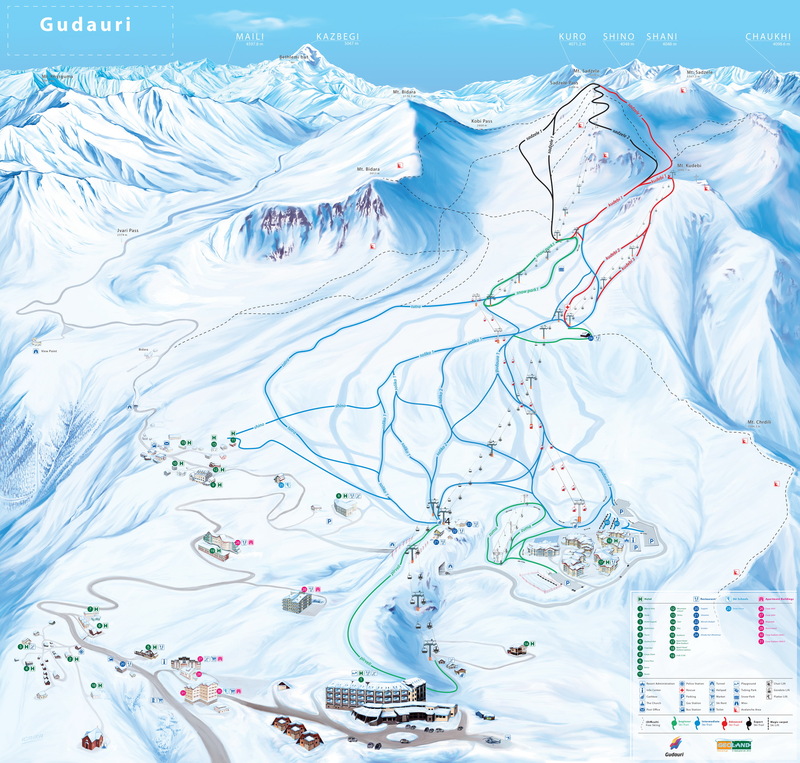 Gudauri is one of the best places for freeride and heli-skiing in the world. Located where Asia and Europe meet, the centre is a combination of wilderness of the Caucasus and a modern infrastructure for skiers. Wherever you look, the whiteness of the mountains is breath-taking offering countless opportunities for free riders. The resort is set over 2000 m above sea level, i.e. well above the tree line, and in the proximity to the Black sea, which guarantees frequent supplies of fresh snow. However, skiers do not live by snow alone, and Georgia definitely has far more to offer than fine snow and fabulous mountains. Georgia can be a culinary adventure of a thousand of fragrances and flavours. Georgia has its own quality wine and unmatched hospitality of local inhabitants who are willing to tell stories about their people and their beloved country. The capital city of Tbilisi is a gem in itself luring intrepid travellers with charming spots set amidst the modern urban space. The Caucasus Mountains extend for over 1000 km from the Black Sea to the Caspian Sea. Mount Elbrus (5642 m), located in Russia near the border with Georgia, is the highest peak in Europe. However, many claim that Mount Kazbek (5047 m) the third highest peak in Georgia, is more challenging to reach. Its majestic peak can be admired from Mt. Sadzele (3279 m), the highest skiing station on Gudauri. 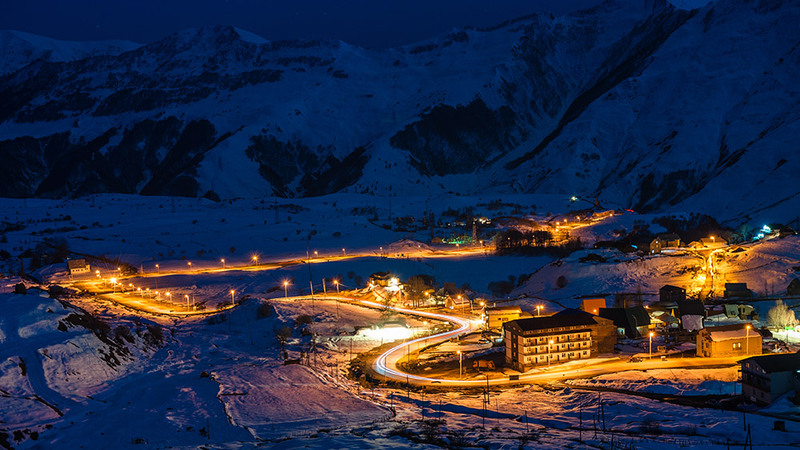 Surrounded by majestic mountain peaks, Gudauri is Georgia’s most modern ski resort which has retained its charm and uniqueness. 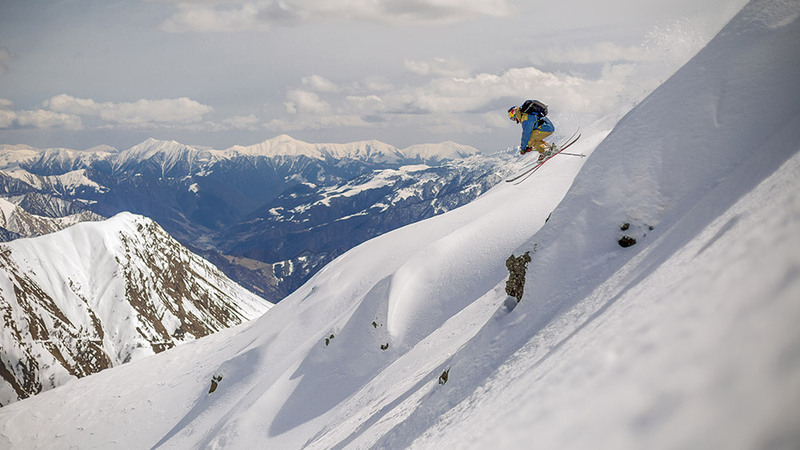 Although it is a mecca for freeride skiers, it has none of the crowds of some European resorts during the high season. Gudauri lies 120 km from Tbilisi, so one does not need to travel far to get to the very heart of the Caucasus Mountains. The resort boasts over 57 km of ski runs (served by Doppelmayr), but who would want to count them all? In most cases, these are sparingly signposted narrow paths across immense slopes, but you can ski everywhere. Long and pretty wide slops with moderate inclination offer a great deal of joy whatever direction you chose to take, be it a nicely groomed route or somewhere away from them. 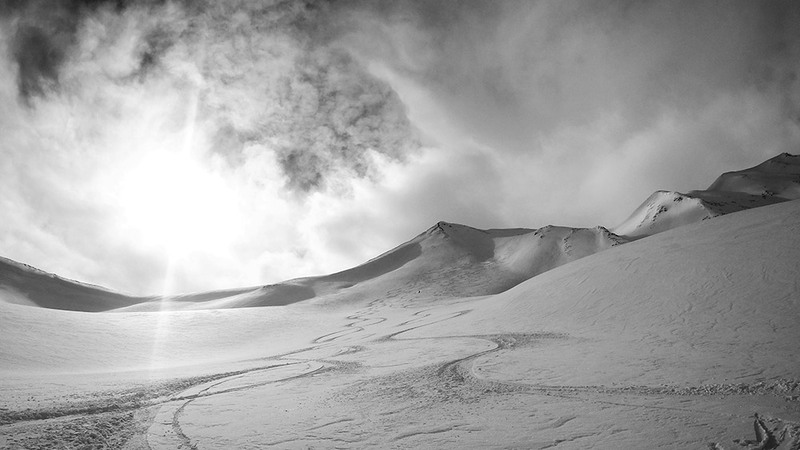 It is a great place for freeride novices and for those who set more ambitious goals away from the skiing civilisation. Wide and open slopes, lots of powdery snow and fabulous views – this is why Georgia is one of the most desirable destinations among freeride skiers. And the Caucasus Mountains are known for superb snow conditions. The mountains are covered in a three-metre layer of snow on average, and between January and March there is lots of fresh snow on top of that. At the beginning of March most southern slopes are covered with spring firn, but when you know where to go, you will still find lots of untouched powdery snow. 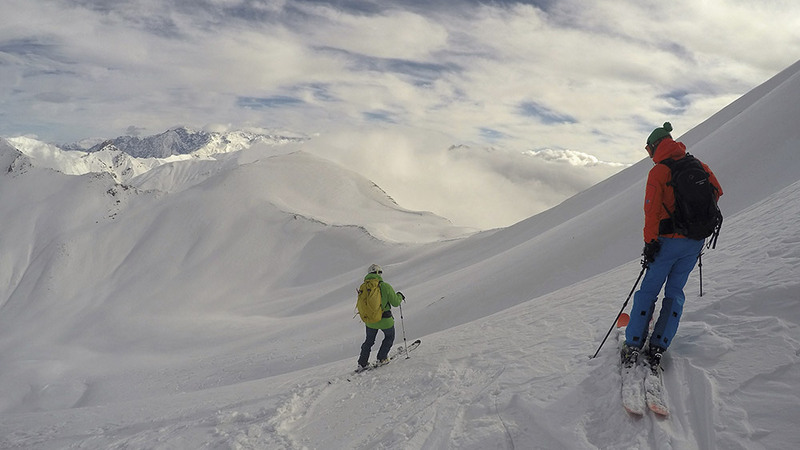 Backcountry and ski-touring. We, along with local expert guides who know every inch of the mountains, will take you to the best off-piste places! The regions of Mt. Kudebi and Mt. Sadzele simply abound in opportunities, and you get there in a modern ski lift. You will be overcome with joy, and this is but the beginning. A long backcountry slide to the village of Kobi is no less impressive. There are long and more ambitious rides around the Cross Pass as well. And if you would also fancy getting some extra sweat climbing up, we suggest the temple on the slopes of Lomisis at approx. 2200 m and Mt. Dedaena. Heli-skiing. Skiers are taken to the wildest places by helicopters. On a sunny day helicopters fly over Gudauri to and fro like a ski-cab. The topography of the place and a big number of possible routes make it possible to experience a few great downhill rides within a day. 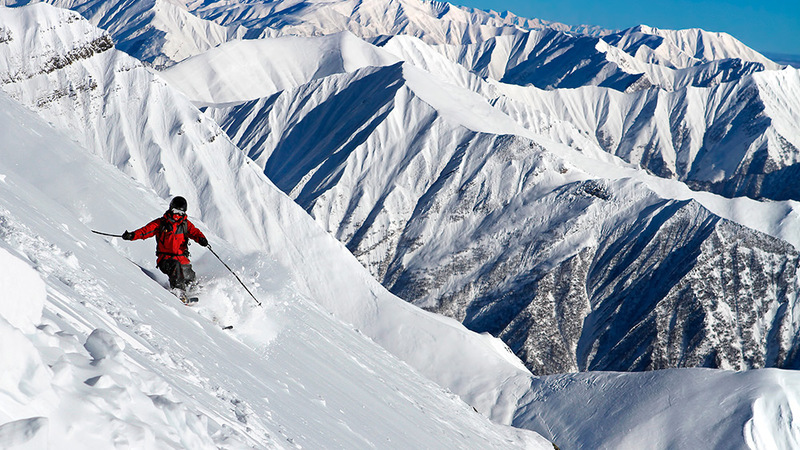 If heli-skiing is on your to do list, Gudauri is the right place to make your dreams come true! Igloo, snowmobiles, and paragliders. 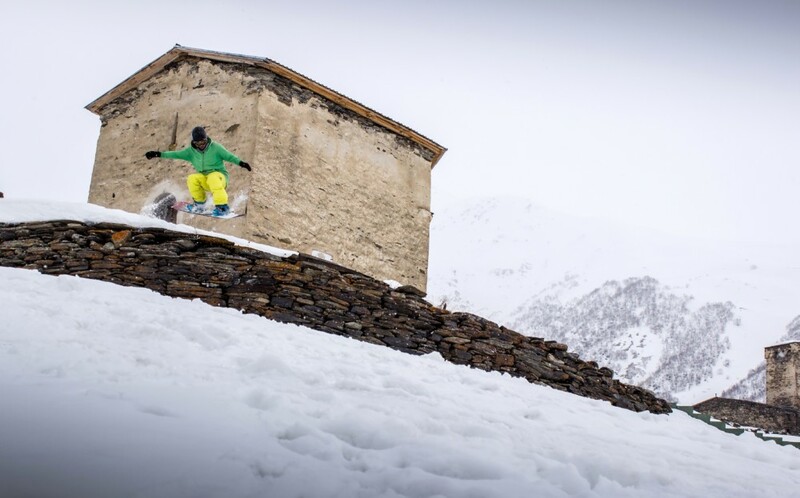 If skiing is not enough, then you can diversify your stay in Gudauri. How about an ski tour to spend a night in a self-made igloo (apparently quite warm inside)? Or what about snowmobiling? Going up snow-capped slopes and rapid manoeuvres by pros do make an impression! And if you wish to see the mountains from above, a view over Gudauri from a paraglider will give you yet another dose of adrenaline! Landscape. Legend has it that when God divided land among various nations, Georgians were feasting and revelling in wine (that bit sounds very real), and, as a result, were not included. They turned up when it was all over. God took mercy on them and gave them the most beautiful piece which he decided to keep for himself. Another legend says that God gave them the most beautiful lands in recognition of their openness and hospitality. And while we confirm that these two features are true, we tend to believe more in the version with the feast and the wine. Tbili. It means “warm” in Georgian. Georgian King Vakhtang Gorgasali ordered the construction of a new capital of Georgia around warm medicinal water springs, and in the 6th c. he moved there from Mtskheta. Today a trip to sulphur baths in the oldest part of Tbilisi is part and parcel of every tourist itinerary. Road. Gudauri is located in the proximity to the Cross Pass (2379 m) marked with a stone cross. This is the highest point of the Georgian Military Road which winds its way amidst mountain peaks. This road is actually the only open border point between Georgia and Russia (featuring a monument to Georgian Russian friendship). This road has willy-nilly become important for skiers as it is frequently closed down due to the avalanche threat, unfavourable weather conditions or due to… other reasons. This can happen at any time of the day and on any day of the week without notice, so it is advised to do some checking before going to the other side of the mountains to avoid getting stuck with no possibility of returning. Local guides will always ask around and they always seem to be in the know. Supra. Georgians do not eat, they feast. A supra is a long festive time at the table when lots of wine is consumed in an orderly fashion. A tamada, or toastmaster, raises toasts with great rhetorical skill, and you need to be alert, since he may ask one of the participants to say a few words, too. Après-ski. If you thought it is a speciality of Alpine resorts, well, think again. In Georgia you will soon find out what chill out on the slope really means. Soft cushions placed near the lower ski lift station are so inviting. You will also discover that mulled Georgian wine and shasliks are an absolute must for skiers! Dance. Georgian traditional culture rests on dance which differs from region to region. Whether it originates from low lands or high mountainous regions, complex choreography, mediaeval costumes, and swords which move with rhythmic music will leave foreigners stunned in admiration! Smoke. A visit to a Georgian bar or night club can be a shock for Europeans who have grown accustomed to no-smoking zones in public areas. Georgians smoke like a chimney, so be ready for washing your clothes upon getting back home. Georgian supra. You cannot say you’ve been to Georgia if you haven’t taken part in a traditional Georgian feast revelling in the local specialities, drinking wine served from huge jugs, and dancing to Georgian music. A supra or a traditional Georgian feast, is not an ordinary dinner. It is not about the food shared among the participants but rather about enjoying the time together. Thus, nobody orders dishes for themselves. All the dishes are placed in the middle of the table and supra participants simply help themselves to them. This principle is worth applying while ordering dinner in a regular restaurant, since this way you will have an opportunity to taste a variety of Georgian special dishes. And it is worth bearing in mind that Georgian dishes are usually too big to be eaten by a single person. Georgian cuisine is fairly simple and very nourishing. It is based on salted cheese, meat, and vegetables which, given the moderate climate, grow here in abundance all year round. The most popular dishes include khachapuri (cheese filled bread) which comes in a variety of flavours, khinkali or meat and coriander filled raviolis (eaten with bare hands, which is not all that easy!). You also have sulguni or brined Georgian cheese and mtsvadi or skewered meat. There are lots of vegetarian dishes made of aubergines, tomatoes, onion and walnuts. Last but not least, there is wine, and lots of it. And this can be a bit of a problem for foreigners who invariably find it really hard to catch up with the natives. You empty the glass at a go only to find out that your glass is full again (with women, the pace is somewhat slower). It can get even more interesting when a horn called kantsi in Georgian appears at the table, and you need to empty the horn at a go, too! In Georgia you do not simply raise your wine glass saying “Cheers”. Georgian toasts are unique. There is a tamada or toastmaster who turns toasts into elaborate speeches praising the family, country, and the invited guests. When the tamade says “Alaverdi!” to a person at the table, he must propose another toast of his own. So you need to be well prepared beforehand. Gaumardżos! Wine. It is commonly known that Georgia is the oldest wine region in the world. While in Georgia, it is a good idea to visit a vineyard where wine is made in traditional clay vessels. Winemaking traditions are very much alive here, and there are lots of places where wine is made exactly the way it was made hundreds of years ago. Iago Bitarishvili’s wine cellar is located in the village of Chardakhi. His vineyard extends over 2 hectares of land, and the production is 100% ecological. Iago is a proud owner of the first eco winemaking certificate in Georgia, and his flagship product is chinuri, white wine, somewhat darker than standard and very rich in taste. Although Bitarishvili’s winery produces a few thousand bottles per year, it is recognised in such countries as France and Japan, and it is not that cheap. After seeing the winemaking process, you can sit at a lavishly set table with Iago and enjoy some Georgian specialities with exquisite wine. At the end of the meal Iago will always offer a glass of home brewed chacha, Georgian traditional pomace brandy. Strong as it is (60 or 70 proof) it has no match to others we have tasted in Georgia. Tbilisi. If there existed a point system for location, topography and landscape diversity, Tbilisi would hit the bull’s eye in all these categories. No wonder that the capital of Georgia is aptly called the Pearl of the Caucasus. 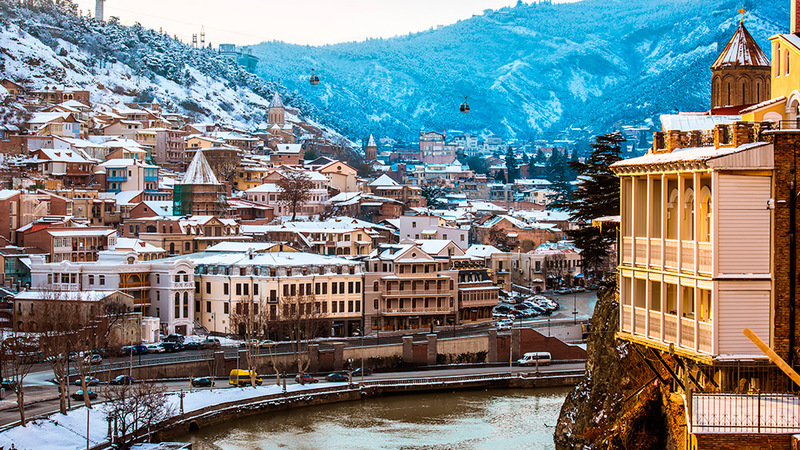 Tbilisi features green hills, rocky slopes, the meandering Kura River, houses built along steep streets that go up and down, and a cable car from the centre to Castle Hill where botanical and zoological gardens are located. 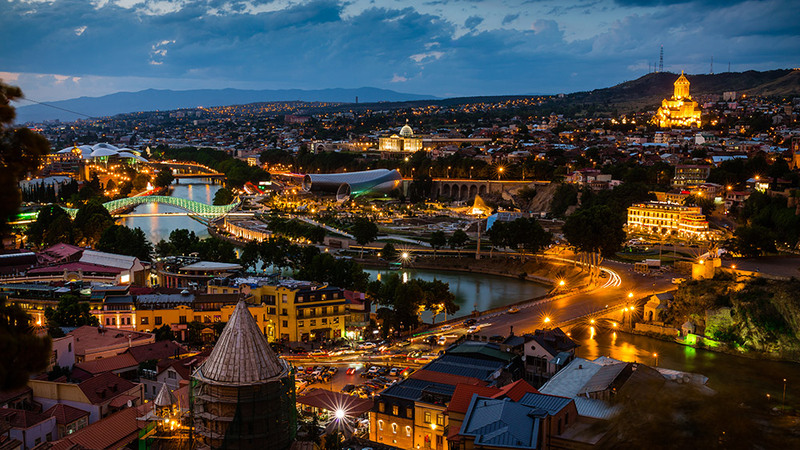 Tbilisi has a definite oriental feel, but it is also a very European city. Historical quarters reminiscent of a fairy tale land are marked here and there with shining titanium buildings and ultra-modern edifices with wavy facades and glass. The inhabitants of Tbilisi complain that when Bidzina Ivanishvili, Georgian billionaire, became Prime Minister in 2012, vast sums of money were spent on the construction of modern buildings and the Prime Minister himself built a large villa with a helicopter pad and… a waterfall on top of a hill overlooking the city. After dusk the city acquires a totally different decor. The beautifully lit riverside, bridges, church towers, and fronts of buildings are truly magnificent. This is the time where shisha bars, restaurants, cafes, and clubs become flooded with people. 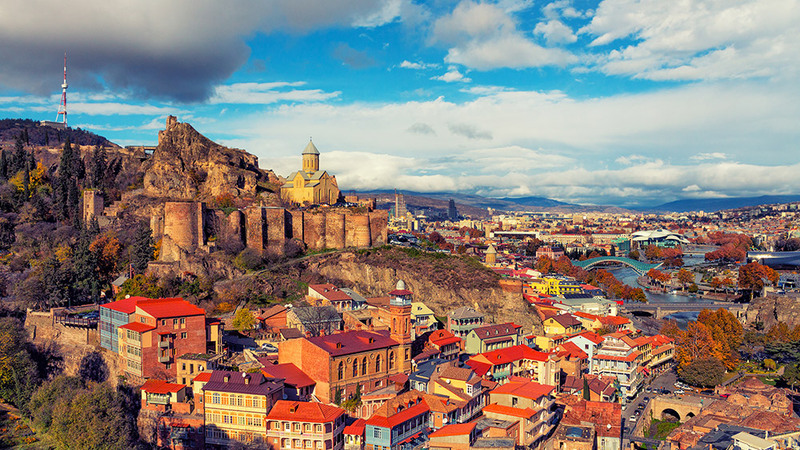 It is difficult to imagine a trip to Georgia without visiting Tbilisi, be it for one day only. Tbilisi is also famous for sulphur baths from the 6th c. The medicinal water at approx. 37˚C guarantees excellent relaxation after the exhausting craze in the mountains. There are now six such baths in operation in Abanotubani, the oldest district of Tbilisi. Uplistsikhe cave town. On the left bank of the Kura River, some 10 km from the town of Gori, lies an abandoned ancient rock-hewn town. It was founded around 1000 BC, but what can be seen today dates back to the Roman conquest and the Middle Ages. The town is a masterpiece of civil engineering. The rock-cut rooms and chambers on several levels are connected by tunnels and staircases. The riverbank features rock-cut amenities and various urban systems for irrigation, storage of food and special wine cellars. Kazbegi (Stepantsminda). A typical postcard from Georgia would feature a stone church built on top of a mountain overlooking Mount Kazbek. Stepantsminda, a small town in the north-eastern part of Georgia located 1750 m above sea level, is accessible by the Georgian Military Road. All tourists agree that this is the most picturesque road in Georgia. However, given its mountainous character, it may not always be passable in wintertime. From Kazbegi there is a two-hour walk to the monastery of Cminda Sameba. To get there by car, you will need an all-terrain vehicle. Gori and Stalin. And here is a real cracker – something quite unthinkable in Western Europe. In Paris you can buy a magnet with the Eiffel Tower, in Barcelona you will get a magnet with a bull, one from Innsbruck will show a panoramic view of the Alps. But here in Gori, you will get a magnet with… Stalin. The memory of this politician of ill repute is still very much alive in Georgia. And while Georgians would prefer to take pride in giving the world a true statesman, many still boast the fact that a son of Georgia became head of the Soviet Empire. This sentiment is most visible in Gori, the dictator’s birthplace. 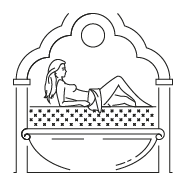 Younger generations would prefer Stalin’s Avenue to acquire a different name, but the older ones have become accustomed to this. A visit to the cottage where Joseph Vissarionovich Djugashvili was born is a must-see. Today the place is surrounded with huge columns with the museum located on the side. There is even Stalin’s personal railway carriage, armour plated, used by the dictator from 1941 to travel around his empire.